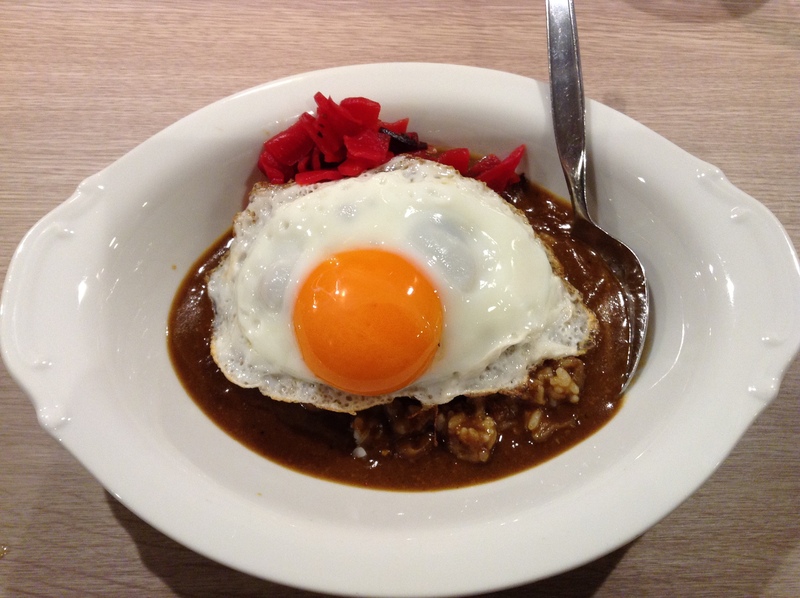 New Castle Curry in Ginza was a great little spot for a bowl of spicy curry topped with an over-easy egg. When I last went, while researching my book, Food Sake Tokyo, it was a second-generation shop in an old, wooden building in the glamorous Ginza district. While shiny new buildings were built up around it, New Castle was a treasured spot for many. Only one type of curry was served here, but at different portion sizes, with or without the egg. Each dish was named after a station on the Keihin-Tohoku line like Kamata or Shinagawa. I was so excited to include it in Food Sake Tokyo, as it was that unique little mom-and-pop shop with really good, simple food. Sadly New Castle closed down two years ago. I would walk by in mourning, sad that I didn’t make it in one last time. I wasn’t the only one. I often saw others stop and stand in front of the shuttered shop, almost offering up a prayer, or perhaps reliving the spicy curry. So, imagine my thrill when I heard that the third-generation has opened up a New Castle Curry, still in Ginza, a few blocks away from the old location. New Castle was packed when I came in recently for lunch. Many of the customers were obviously regulars as they didn’t even have to call out a station name like “Omori”, but just said that they’ll have the usual. I started off with a green salad and had the Kamata (photo above) for 740 JPY. For Japanese curries it is on the spicy side. The menu suggests first trying just the curry, then some curry with rice, and finally with the egg. This new spot can not be compared to the old spot as it had so much charm and character, developed over 66 years in one spot. It was a dark restaurant and even the lights felt as if they were covered in dust, giving off only a faint light. The new spot is a long counter overlooking an open kitchen with a few seats off to the side. The back wall of the kitchen is a bright red color. Some bottles of whisky lined the back wall. No one ordered whisky at lunch, but I imagine at dinnertime a few glasses are shared amongst friends. The family is very warm and welcoming and it’s a great bowl of curry. The location is not as convenient as the old one, which was closer to Yurakucho. The new one is closer to Showa Dori. But, it’s only a few blocks off of Chuo Dori, the main drag of Ginza. The third-generation oversees the kitchen while his father greets the customers and manages the cash register. The curry is just as I remember it. Spicy, savory, and satisfying. Welcome back New Castle. You have been missed. The shop was closed for about a year before this reincarnation opened last year. Restaurants like this is what makes Tokyo such a great dining city. Great food that has been passed down for generations. The energy in the new spot is very different from the last one. It feels as it has new life and a renewed spirit. In this Japanese blogpost, you’ll find a lovely photo of the second- and third-generations, as well as photos of the outside of the shop so it is easy to find. We are planning for another day trip to Tokyo (I’m near Osaka) less than 2 hours by Shinkasen, so not bad, my husband and I both are smitten with all-things-curry! So I’m going to bookmark this eatery for when we go. I went and theyproprietor and son were very nice and friendly. i loved it! Thank you Yukari!! Glad you liked it. They are very kind. Love small shops like this!